From U.S. President Donald Trump’s initial conversation with Taiwan President Tsai Ing-wen to his recent reaffirmation of the “one China’”policy with China President Xi Jinping, assess the impact of Trump’s volte face on Taiwan. “One China” is a useful conceit, a nebulous concept that all sides interpret according to their own needs and giving each side space to operate. Trump’s initial indication that the U.S. might challenge or reject “one China” policy was a major shock, not just to Beijing, but to Taipei as well. At the present time, the “one China” framework is the mechanism that allows Taiwan to maintain its functional autonomy and peaceful productive relations with the PRC. Taiwan does not gain anything from disrupting the status quo. The call was an effective way for Taiwan to put itself back on the agenda in Washington (having lost salience under Obama), and a way for Trump to signal that he is going to do things differently vis-à-vis China. But the most sensible thing that the Trump administration has done to date is to reaffirm its commitment to “one China.” Doing so is welcome in Taipei. How should President Tsai Ing-wen strategically position Taiwan amid the uncertain direction of U.S.-China relations? Despite the election of Tsai Ing-wen, the level of conflict in cross-Strait relations is stable and manageable, and the last thing Taiwan needs is to become embroiled in a confrontation or a “pawn” in the Trump administration’s plan to re-calibrate Sino-U.S. relations. The Tsai administration has been consistent in its commitment to maintaining the “status quo” (another nebulous concept), avoiding rocking the boat and keeping a low profile. Tsai’s major policy programs are focused on the Taiwanese domestic economy and a raft of social issues, while attempting to quietly reduce dependence on the Chinese economy. 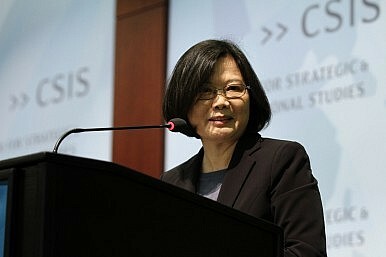 The understated approach is Tsai’s calling card, and at a time of uncertainty, the safe strategy. The Trump call was a bold departure, but Tsai was largely praised for taking advantage of an opening to raise Taiwan’s profile with the new U.S. president. Taipei understands that Trump’s volatile and inconsistent preferences require a cautious approach. Explain the stakes for Taiwan in strengthening relations with Japan and Southeast Asia. Taiwan operates under difficult conditions: its most important economic partner is simultaneously an existential threat to its functional autonomy. China has substantial leverage over the Taiwanese economy, preparedness for military coercion, and an extensive “United Front” repertoire operating in Taiwan. Meanwhile, Taiwan continues to face marginalization in international society. Given this context, the Tsai administration has prioritized diversifying away from dependence on China, while seeking to maintain peaceful cross-Strait relations. Economically, China’s huge comparative advantages have decreased over time, and Tsai’s new “Southbound Policy” looks more likely to gain leverage among Taiwanese business than Lee Teng-hui’s mid-90s effort. Relations with Japan are somewhat different, with greater diplomatic and symbolic significance than the ASEAN countries. There is substantial sympathy between Japan and Taiwan, and resistance to unification for different reasons. Given the difficult relationship between China and Japan, both Tokyo and Taipei have to balance the mutual benefits of cooperation with consideration for antagonizing Beijing. But there is an obvious rationale for Taiwan to seek stronger ties with Japan as a bulwark against Chinese pressures. How might you explain Trump’s “Tweetocracy” as a primary means of presidential communication to Chinese and Taiwanese audiences? Trump’s unique form of presidential communication, essentially stream of conscious tweeting, is something new for everyone. Taiwanese have become used to direct unmediated communications from their own politicians via social media, but nothing has prepared them for Trump’s Twiplomacy. Trump’s unfiltered dispatches are a dramatic departure from Chinese officials’ formal and carefully scripted communications via state media. Much of Trump’s tweeting is refracted through Chinese language media and online commentary, where it is contextualized and frequently ridiculed. The influence of Trump’s tweets on Chinese and Taiwanese audiences is less important than governments on all sides learning how to interpret them. The trilateral relationship is complicated and potentially combustible, and intemperate, unclear or provocative missives emanating from Trump’s Twitter look like a feature of his presidency that will have to be managed. Identify strengths and weaknesses in the Trump’s administration’s China policy. There are several difficulties in assessing the Trump administration’s China policy. The first is to identify who is making policy, or who has greater influence at any point in time. As in other areas of policymaking thus far, parsing conflicting statements made at different junctures suggests that the Trump administration does not have a unified position or consistent policy direction on China. There is so much volatility in Trump’s own positions that predicting what his actual preferences are is difficult. Despite the (sometimes) harsh rhetoric on China, there is no clarity on what the Trump administration actually intends to do on China, and whether it has the capacity to execute. In the meantime, the overall sense that the U.S. under Trump intends to draw back from global leadership in a range of sectors opens space for China to take an expanded role. The confusion over policy direction and haphazard operationalization in U.S. government represents a strategic opportunity for Beijing, which has the capacity and motivation to take advantage of. Prominent observers and scholars are worried now is not the time to push for a radical paradigm shift in the unofficial U.S.-Taiwan relationship.